Published by the American Bar Association (ABA), A Practitioner's Guide to Innocent Spouse Relief takes you step-by-step through the Innocent Spouse claim process, from information gathering, to administrative proceedings, to determination, to trial, and to refund relief. 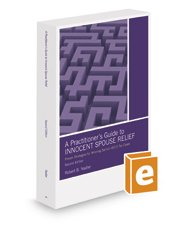 Several major developments have occurred since the initial publication of A Practitioner's Guide to Innocent Spouse Relief. Notable developments included the IRS abandoning its position that taxpayers claiming equitable relief were limited to a two-year statute of limitations. The IRS also published Rev. Proc. 2013-34, which provided new guidance in equitable relief cases.